He has called auctions in twenty three states and Canada. He was the 1968 World Champion Auctioneer. A house he helped design won a national architecture award. He's operated several ranches, he's an avid hiker and mountain climber, and he had a hand in the beginnings of at least three sale barns. "First of all, we don't call them 'sale barns,' they're auction markets. It's not a 'barn,' it's a marketing facility." Robert Schnell would know what he's talking about. And "we" could be members of the auction community or his own extended family, since they are closely intertwined. Robert Schnell was born in 1930 in Dickinson, N.D., one of thirteen children born to Ray and Millie Schnell. Ray Schnell must have been a colorful character. Recognizing the need for an auctioneer in western North Dakota, he attended an auctioneering school in Chicago, Ill. Upon his return, he split his time between a diverse farm/ranch outside of Dickinson and a steady farm auction business, mostly tasked with the necessary but unpleasant business of liquidation auctions during the Great Depression. He also found the time to be a state legislator, even serving as North Dakota Speaker of the House of Representatives at one point. "There was no market for the producer in western North Dakota at that point," says Robert. "The closest markets were West Fargo, which was a terminal market, and South St. Paul." Living three miles outside of town, being an auctioneer, and seeing demand for a local auction market led Ray Schnell to found what was then Dickinson Livestock Market in 1937. Now Stockmen's Livestock, it is the largest livestock market in western North Dakota, and still owned and operated by the Schnell family. The original Dickinson Livestock building was a barn made respectable by the Schnell family. "It was an old fairgrounds barn, with an auction ring for the fair. We just put gates on the horse stalls and built a few pens around the barn to hold the cattle." "We didn't have a lot of extra employees, it was mostly a family-run business. My mom and my sisters ran the office, which back then was a two by twelve plank across a horse stall with a hand adding machine. My brothers and I moved the cattle in and out of the ring and my father sold them off." "There were challenges at first, but buyers were anxious to come because there were good cattle in western North Dakota and it saved them a trip to South St. Paul." As the fledgling Dickinson Livestock grew, the Schnells expanded their pen space, and in 1947 built a new sale pavilion with 5-6,000 head capacity, co-designed by an engineer from St. Paul. "In the beginning a lot of cattle were trailed into the yard, and you started to see the small straight trailer. Of course that was the beginning of the big semi-truck. A lot of the producers at that time were selling five, ten, maybe twenty head." Life was busy for the Schnell family. They began raising Quarter horses and registered Hereford cattle in the 1940s, wich they sold through Dickinson Livestock. In 1950, Ray sold interest in the auction market to the four oldest boys, keeping around a fourth interest for himself. This allowed him to spend more time on the ranch and more time at his politics. "My father sold his remaining interest in Dickinson Livestock about ten years later, but he remained active in the markets until the day he died." Robert joined the U.S. Army in 1952. Upon his return he helped manage Dickinson Livestock and the ranch outside Dickinson. It was at this time that Robert began his life as a professional auctioneer, inspired and mentored by his dad and brother Howard, who died in a plane crash in 1955. "Howard was the best auctioneer in the family" says Robert. Howard had developed a regional demand for his services at purebred auctions, and Robert picked up the mantle in 1956. "I got word of mouth coverage mostly. People liked the way I sold 'em, and they hired me, and it just grew from there." Unlike his father, Robert never went to auctioneer school, but as he says he "had the best teachers" in the form of his family. Asked if his mom would ever "find him out behind the barn, just a workin' up an awful storm" he says "no, but if she'd have followed me and my horse around, she might have heard something." It was during his purebred auction years, if not before, that Robert began hiking and mountain climbing. "As a purebred auctioneer you have to be fit and healthy. The yearly income for these producers is riding on that one sale, and you can't have a sick auctioneer, or an auctioneer that's not up to par. It's very physically demanding. You're selling from two to six hours and to talk that fast for that long you have to be fit." To stay in shape, most mornings he would run three to five miles before a sale. That may sound incredible, but he explained that he didn't have time after the sale. "You'd do the sale and be off to the next one. I would leave and get within fifty or sixty miles of the next sale, stay overnight, and get there in the morning." Some sales were 700 or more miles away from the previous day's sale, and in all the years he drove from one sale to another, he never had an auto accident. He always had "a good hat, a jacket, a tie, and a nice white shirt." If there was any partying at these sales, he was not part of it. "No, it was all business." At this point, the narrative gets as complicated and confusing as the Schnell family lives must have been. In 1961, the family began auction markets in Miles City, Mont., and Lemmon, S.D. In addition, the family added three more ranches to the enterprise. Eventually, older brother Raymond managed Miles City Livestock and Willard managed Dickinson Livestock. 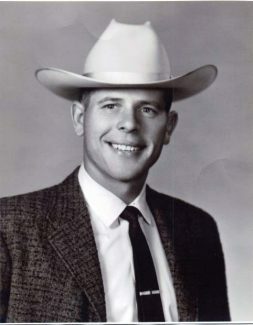 By 1966, Robert had sold his interest in Miles City Livestock and bought his brothers' interests in Lemmon Livestock, including the ranch near Lemmon. "There was an auction market in Lemmon that wasn't doing very well, and we increased the volume of sales about tenfold. We bought the yards and buildings, but we built a new facility and a good facility and we eventually sold the old one." During this time, regardless of ownership or management, members of the Schnell family helped whenever they could at each market; Miles City held their auction on Tuesday, Dickinson on Thursday, and Lemmon on Saturday. "We never ran out of auctioneers," Robert says "'cause we raised them." Fall and spring were spent traveling to purebred auctions, there was a ranch for him to run and an auction market to manage. "I didn't really do credit to the Lemmon market, because it's hard to do purebred sales five or six days a week, and then come back and do the home market. In 1968, Robert became the World Champion Auctioneer. The competition was in Florida that year. "Of course that was a kind of a crown in my hat and it got me a lot of sales." Robert sold Lemmon Livestock in the 1970's to focus on ranching and the purebred auction business. "We had a registered Hereford herd, a registered Angus herd and a registered Saler herd. Of all my cows, those Salers were my best breed of cattle for breedback, growth-ability and general efficiency." He finished steers, first at Kearney, Neb., and later at Belle Fourche. In addition, he began to lease grazing ground in and around Rapid City from businessmen and real estate developers wanting to keep ag valuation. "I got to ranch and live in town, so I really enjoyed that. I built all my fence, and you had to have good fences. One time out on Catron Boulevard, a guy went through one of my fences and my cows got out, but it didn't happen very often." The house he and his wife live in now was the headquarters of the Rapid City ranch. Robert doesn't advise attempting more than one auction enterprise at a time these days. "No, it's so competitive now. You should just stick with one market. They're getting so big, you see consignments of up to 300 head or more, and you didn't use to see that too often. You've got to have enough cattle in one place in one day to attract the buyers that you need." "There's some terrific young auctioneers coming along," says Robert "and they're getting better all the time. I'd hate to compete with these young guys, because they're getting very good." He doesn't see a dramatic shift in price as an impediment to a good auctioneers' performance or mindset. "You have to know the value of that animal or he's not gonna make it. If you just put a mouthpiece up there, that's not gonna work. Young auctioneers are going to need a lot of practice, and it's a good idea to get affiliated with a salebarn and learn that way." But time and again, Robert returns to the subject of his Lemmon ranch. "Ranching was my first love. Of course my son Carter runs it now, and he's doing a good job, a better job than I did, but I think he had a great teacher." By subdividing pastures and using carefully managed rotational grazing, Robert estimates that Carter produces 50 percent more beef per year than he did and has been able to withstand drought years without shrinking the cowherd. "He's up to twenty seven pastures now. Of course we were fortunate to have two rivers running through the place and a creek. We also have windmills and tanks in the outlying pastures." Robert retired at age 75; he and his wife Phyllis enjoy hiking and mountain climbing in the Black Hills and visiting children in Texas and Oregon during the winter. In the summers he spends as much time on the ranch as he can. The auction market in Dickinson, now called Stockmen's Livestock, is still owned by Willard Schnell and his son Larry, who is the manager. One of the ranches previously owned by the Schnell family is now a North Dakota State Park. And Robert will be helping Carter ranch as long as he possibly can.